A beautiful and poignant tribute to Australian soldiers, Reflection: Remembering Those Who Serve In War mirrors the experiences of a family attending a dawn service and Anzac March with moments on a variety of battlefields and peacekeeping missions throughout Australia’s military history. From the South African “Boer” War (1899 – 1902) to modern settings such as the second Gulf War in Iraq (2003 – 2009), East Timor (1999 – 2012) and Afghanistan (2001 – present), Reflection captures moments in time echoed in the symbolism present in our Anzac Day commemorative services. 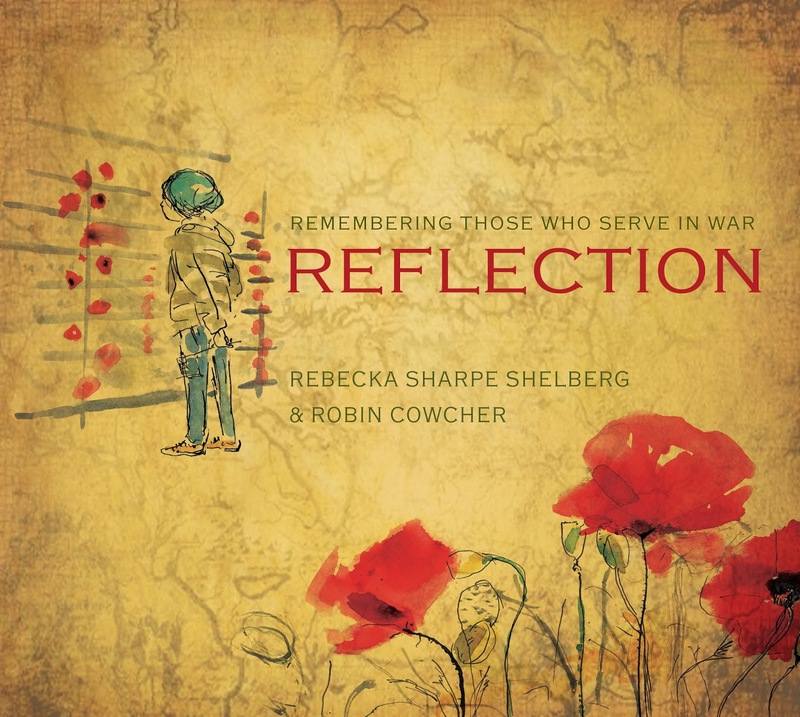 Rebecka Sharpe Shelberg’s text is sparse but cleverly constructed as it connects the illustrations of the modern day commemorative service and the conflict or peacekeeper scenes. Robin Cowcher’s emotive pen, ink and watercolour wash illustrations cleverly find visual links between the two scenes. From feet moving in the dark and heads bowed in prayer, to groups silently watching the sunrise or listening to the last post, the illustrations emphasise both the differences and shared experiences for the two distinctly different settings shared on each double page spread. Reflection is aptly named. It invites readers of all ages to reflect on what the rituals of our remembrance services commemorate, and the link between everyday Australians and the soldiers on the battlefield and peacekeeping missions. This picture book emphasises connection and community, while also reminding us of the sacrifices made by those men and women who are willing to go so far from their home to serve and protect. The gentle thoughtfulness of this book brought tears to my eyes. A very special book to be treasured by those with family who have served in our military or peacekeeping forces, or those who appreciate and respect the sacrifice of our servicemen and women.